Looking back at 1948 largely through the black and white filters of film and photos seems to capture a grim era of austerity when basic items like food were still subject to the rationing imposed in war time. But daily life in Scotland also had its fun, excitement and even colour. Glamour had returned to Edinburgh with its new Festival. 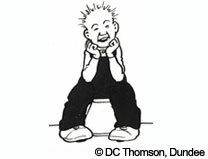 Oor Wullie on his upturned bucket offered weekly cheer along with the Broons. Hibs had won the League, Rangers the Cup and East Fife the League Cup. Henry Cotton had just won his third British Open at Muirfield. And Cathie Gibson from Motherwell was about to head off to the London Olympics where she became the only British swimming medallist. Millions went to the pictures . . . to see a stunning Moira Shearer dance ballet in the Red Shoes. And the prospect of Whisky Galore then being filmed in the Western Isles during a summer of flash floods. The NHS didn’t suddenly appear from nothing on July 5, 1948. It also did not create a single new nurse, doctor or bed. Health Minister Aneurin (also known as Nye) Bevan merely nationalised the existing system across the UK. The revolutionary change was to make all services freely available to everyone. Half of Scotland’s landmass was already covered by a state-funded health system serving the whole community and directly run from Edinburgh. The Highlands and Islands Medical Service had been set up 35 years earlier. In addition, the war years had seen a state-funded hospital building programme in Scotland on a scale unknown in Europe. This was incorporated into the new NHS. Scotland also had its own distinctive medical tradition – centred on its medical schools rather than private practice. And a detailed plan for the future of health with the Cathcart report. Through the writings of AJ Cronin, the creator of Dr Finlay, it also shaped public opinion in favour of a National Health Service by exposing the injustices of existing provision. 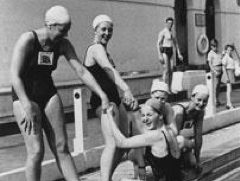 British Olympic Ladies Swimming Team 1948. Featuring Motherwell's Cathie Gibson being pulled from the water.